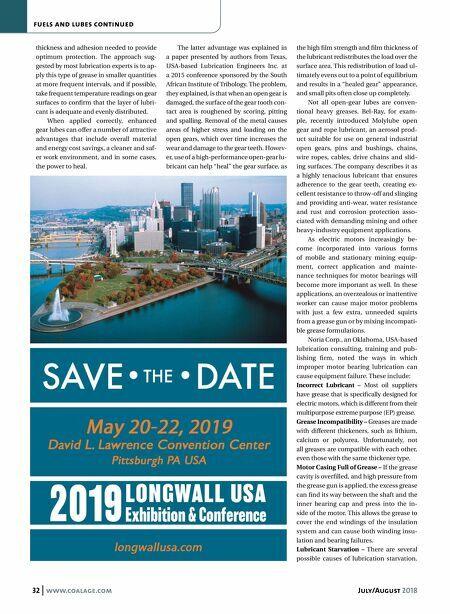 Coal Age Magazine - For more than 100 years, Coal Age has been the magazine that readers can trust for guidance and insight on this important industry. July/August 2018 www.coalage.com 33 fuels and lubes continued The first is insufficient grease being added during installation. The second is inap- propriate, elongated relubrication inter- vals. The third involves the possibility that the oil has separated from the thickener base due to excessive heat. Overpressurization of Bearing Housing – Overpressurization of the bearing hous- ing causes stress on parts that were not designed to handle the pressure. Keep in mind that the standard manual grease gun can produce pressures up to 15,000 psi. Overheating Due to Excess Grease – Too much volume will cause the rotating bear- ing elements to churn the grease, trying to push it out of the way. This results in parasitic energy losses and high operating temperatures, and increases the risk of oil separation and bearing failure. Klüber, a global supplier of specialty lubricants, recently introduced Klubersus- tain GW 0-460, an industrial gear lube that uses water as a functional constituent. It's the first product in what Klüber envisions as a family of water-based lubricants that can offer both environmental and perfor- mance benefits, and the company sees a good correlation between these future products and the mining industry trend to- wards electrification of power trains. 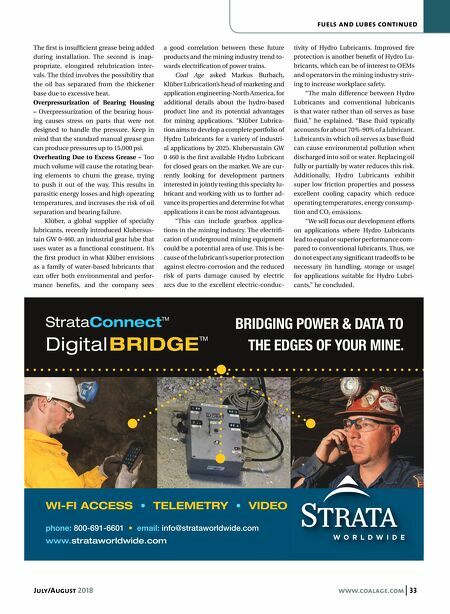 Coal Age asked Markus Burbach, Klüber Lubrication's head of marketing and application engineering-North America, for additional details about the hydro-based product line and its potential advantages for mining applications. "Klüber Lubrica- tion aims to develop a complete portfolio of Hydro Lubricants for a variety of industri- al applications by 2025. Klubersustain GW 0 460 is the first available Hydro Lubricant for closed gears on the market. We are cur- rently looking for development partners interested in jointly testing this specialty lu- bricant and working with us to further ad- vance its properties and determine for what applications it can be most advantageous. "This can include gearbox applica- tions in the mining industry. The electrifi- cation of underground mining equipment could be a potential area of use. This is be- cause of the lubricant's superior protection against electro-corrosion and the reduced risk of parts damage caused by electric arcs due to the excellent electric-conduc- tivity of Hydro Lubricants. Improved fire protection is another benefit of Hydro Lu- bricants, which can be of interest to OEMs and operators in the mining industry striv- ing to increase workplace safety. "The main difference between Hydro Lubricants and conventional lubricants is that water rather than oil serves as base fluid," he explained. "Base fluid typically accounts for about 70%-90% of a lubricant. Lubricants in which oil serves as base fluid can cause environmental pollution when discharged into soil or water. Replacing oil fully or partially by water reduces this risk. Additionally, Hydro Lubricants exhibit super low friction properties and possess excellent cooling capacity which reduce operating temperatures, energy consump- tion and CO 2 emissions. "We will focus our development efforts on applications where Hydro Lubricants lead to equal or superior performance com- pared to conventional lubricants. Thus, we do not expect any significant tradeoffs to be necessary [in handling, storage or usage] for applications suitable for Hydro Lubri- cants," he concluded.